හරි අපි දැන් බලමු General Settings යටතට එන්නේ මොනාද කියල. අපි දැන් ඒ settings හදන හැටි බලමු. අපිට අපේ email address එකට එන mails මේ software හරහා access කරන්න පුළුවන් වෙන විදිහට හදාගන්න අපිට කරන්න තියෙන්නේ email (0) කියන තැනට අපේ email address එක දෙන එක.ඊට පස්සේ password(1) කියන තැනට අපේ email එකේ password එක දෙන්න ඕනේ.ඔයාලගේ email එකට 2 step verification option එක enable කරලනම් තියෙන්නේ ඔයාට සිද්ද වෙනවා ඔයාගේ email host ගෙන් මේ application එකට mail access කරන්න පුළුවන් වෙනමම password එකක් ගන්න.ඊට පස්සේ save button එක click කරන්න. voice settings කියන්නේ මේ software එකේ කතා කරන voice එක පිරිමි කටහඩකින් හෝ ගැහැණු කටහඩකින් කතා කරන එකයි.එකට අපිට කැමති කටහඩ select කරලා save button එක click කරන්න. මෙතැනදී අපිට පුළුවන් අපි දීල තියෙන නගරයේ කාලගුණ වාර්තාවක් ගන්න , ඒ කියන්නේ weather report එකක්.එක කරන්න නම් අපිට ? 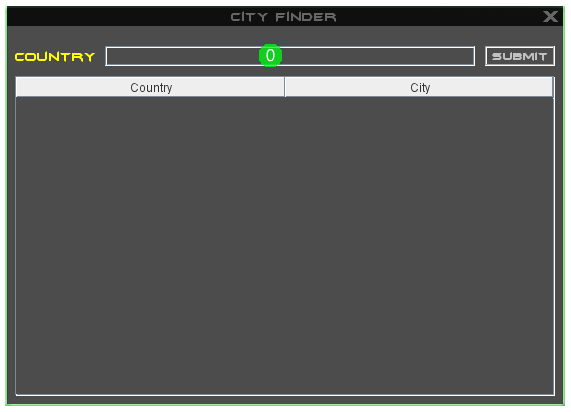 (3) කියන button එක click කරලා city finder කියන window එක open කරගන්න වෙනවා. ඊට පස්සේ country කියන field (0) එකට අපිට අදාල වෙන රටේ නම type කරලා submit කියන button එක click කරන්න.ඊට පස්සේ පහලින් ඒ රටට අදාළ නගරවල නම් ලිස්ට් එකක් දෙනවා.එතනින් අපිට වඩාත් ලගම නගරය තෝරාගෙන ඒ නම කලින් window එකේ city කියන field (2) එකේ type කරලා save button එක click කරන්න. mp3 player එකේ play කරන්න ඕනේ සින්දු තියෙන folder එක තෝරලා දෙන්න ඕනේ මෙතනින් තමයි.ඒකට select (4) කියන button එක click කරලා අපේ පරිගණකයේ සින්දු තියෙන folder එක select කරන්න.ඊට පස්සේ ඒ folder එකේ තියෙන ඔක්කොම mp3 සින්දු ටික software එකට load කරගන්නවා. mp4 player එකේ play කරන්න ඕනේ videos තියෙන folder එක තෝරලා දෙන්න ඕනේ මෙතනින් තමයි.ඒකට select (5) කියන button එක click කරලා අපේ පරිගණකයේ videos තියෙන folder එක select කරන්න.ඊට පස්සේ ඒ folder එකේ තියෙන ඔක්කොම mp4 videos ටික software එකට load කරගන්නවා. picture library එකේ පෙන්නන්න ඕනේ පින්තුර තියෙන folder එක තෝරලා දෙන්න ඕනේ මෙතනින් තමයි.ඒකට select (6) කියන button එක click කරලා අපේ පරිගණකයේ pictures තියෙන folder එක select කරන්න.ඊට පස්සේ ඒ folder එකේ තියෙන ඔක්කොම pictures ටික software එකට load කරගන්නවා. mail client එකෙන් read කරන mails වල තියෙන attachments computer එකට download වෙන folder එක මෙතැනදී select (7) කියන button එක click කරලා select කරන්න ඕනේ. මම ඊලග පොස්ට් එකෙන් පෙන්නන්නම් automation කියන tab එකේ තියෙන settings වලින් කරන්නේ මොනාද කියල.